Indiana. Take a moment to browse though these web pages to get a better idea of what I can do for you. Then give me a call so we can discuss how our proffesional services can address your specific concerns. Whether your purchasing a property or simply needing a termite inspection for a refinance. You can feel confident I will provide you with valuable information. Put my thirty eight years of hands on experience in the construction industry to work for you. I've experienced Tons of "Been There Done That", so there's not much in this industry that stumps me. Coupled with my years of nothing but inspecting properties since 2011, you're sure to get your monies worth. "My rates are based on my value and most often will not reflect the cheapest." Congratulations on your new purchase. Now pat yourself on the back for getting a home inspection. You've already spent many hours searching for your new home. The appraisal is in the works, the financing is set, now comes the home inspection. Stay excited, don't stress out. I've got you covered. This is my only job, and I'm real good at it. My job is to asses the property and report my findings to you in a clear and concise manner. Enjoy this stage of the home purchasing process, and feel confident in hiring HyTek Home Inspections. 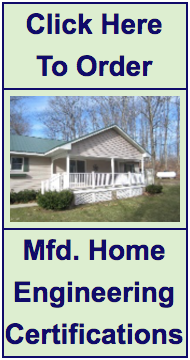 Engineered Foundation Certificate Inspections for Manufactured Homes are available at competetive rates. We get a lot of phone calls everyday from people who are feeling a bit under pressure. Allow us to answer your questions and explain the Why, When, and What If's concerning your particular circumstances. your choice of repair personnel. We want you to feel totally comfortable with Your Decision in hiring HyTek Home Inspections. We live in a High Tech world and HyTek Home Inspections does it's best to keep up with these new technologies. We are utilizing several of these new technologies to provide our customers with better information. This is what I see using my Infrared Thermal Imaging camera. Although this technology doesn't allow me to see through walls like superman. It does allow me to see more than the naked eye. This translates into my benifit as well as yours.